Welcome to the website for Phoenix Singers, an amateur choral society that was founded by musician Malcolm Russell in 1976. We are based in the historic and lively market town of Framlingham in east Suffolk. With a choir of between 50 and 60 mixed voices we perform three concerts a year, mainly of sacred/liturgical but occasionally secular music, in either St Michael's Parish Church, Framlingham College Chapel or the Headmaster Porter Theatre at Framlingham College. 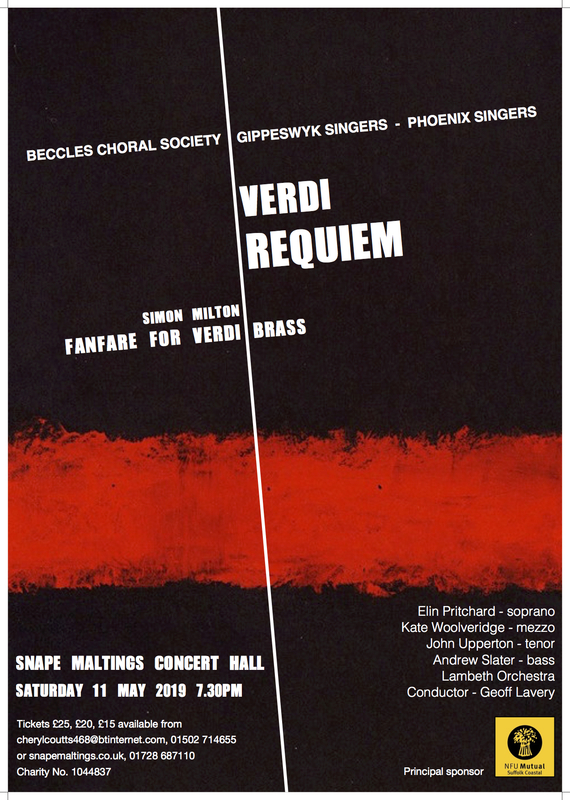 Sometimes we combine forces with other choirs to perform a major work at Snape Maltings or elsewhere. For most concerts Phoenix Singers engages professional soloists and a small orchestra of mostly professional musicians, with the aim of giving a high standard of performance. Phoenix Singers is not an auditioned choir. If you would like us to get in touch to discuss potential membership with you, or to enquire about any other aspect of the choir's life please email phoenixsingers@outlook.com with your contact details so that we can do that. Membership subscriptions are currently £135 per year, payable at the beginning of the Autumn Term; often a £10 discount is available for members paying before the Annual General Meeting at the end of September. Singers joining later in the year pay on a pro rata basis (£45 per term) and in exceptional circumstances termly payments can be agreed at the Treasurer's discretion. A contact details form can be downloaded here to help you. We require this to authorise us to add your contact details to our membership list. Phoenix Singers is a Registered Charity No 1076549 and is affiliated to Making Music, the national federation of music groups and societies.